The very first thing I noticed was the slightly brighter shade of green that was close to what I’ve seen in Strawberry Cough, which is a personal favorite. However that’s where the similarities ended. When I broke open a nug to smell, something interesting happened. The aroma’s all played well together, but it was like they were in silo’d pockets in the buds. When I smelled the half of the nug in my right hand it was wrapped up in a kushy, dank profile. Whereas the half in my left hand was delicate and floral, specifically like a young, Spring flower. The combination was good, even if a little underwhelming. Champagne Kush from Blue Roots is a cross of Burmese Kush x Hash Plant. Whereas I know Burmese Kush is a bit on the brighter side of the kush spectrum, Hash Plant historically has knocked me out when I’ve smoked it so I was expecting to be taken down a notch. Not the case! Blue Roots pulled a really functional high out of their Champagne Kush. One thing I love about Blue Roots is their packaging. They listed the parent strains as well as a peek into the terpene profile on their bud. Champagne rocks it in myrcene (which is a terpene also found in mangos). Although myrcene is a typical indicator of indica effects, I wouldn’t call Blue Roots Champagne Kush sedative by any stretch. The high settles in like waking up on the right side of the bed. Not necessarily super amped and ready to conquer the world, but definitely euphoric. Blue Roots is a well known name in the industry, they clearly know how to grow some good weed. 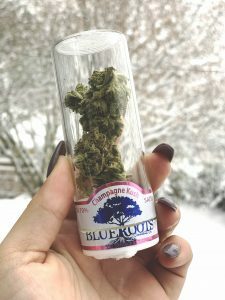 Champagne Kush was a pleasant smoke, and would make a great suggestion for someone looking to smoke throughout the day and still be functional. For a seasoned smoker, I was left wanting a little more out of it. If you’re cannacurious or trying to introduce a friend to the joys of weed, this would be a great strain to pick up. Discover a Higher Quality of Life. Pick up your online orders using our Express Window. 420 Sales + Kirkland Grand Opening at Evergreen Market!